Pysanky is a Ukranian Easter egg decorated using wax and batik method. It is truly an artistic Easter egg.I especially like the intricate painting and vibrant dye colors. It is wonderful to see an old world tradition come alive, being practiced by a good sweet friend of Dee's.You meet the most interesting people at her home. Susan has been making these beautiful Pysanky Easter eggs for a while. 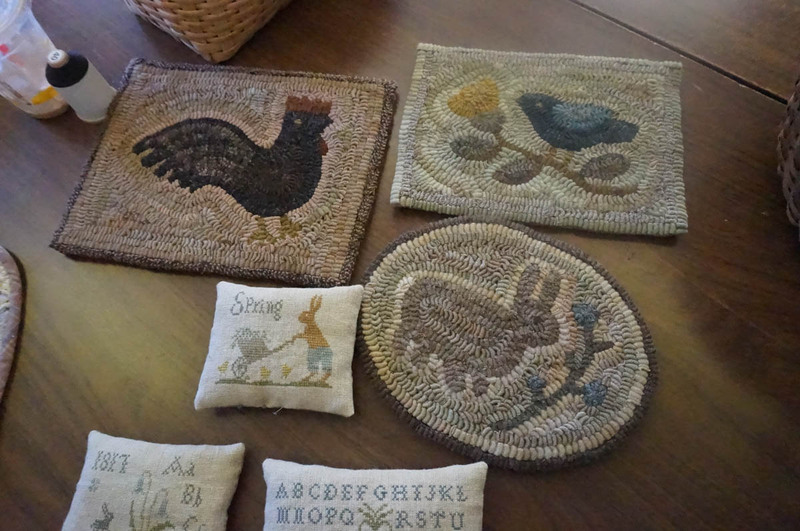 This method of egg dyeing is used by Polish, Russian and surrounding countries.Susan told me how she originally found a kit at a Polish church and from there she started experimenting. I love her painted eggs! They are simply a delight to see. Be sure and enlarge to see the detail of the eggs. Susan even made the Pysanky Easter eggs as a child using red onion skins.I bet they were pretty. As we approach the wonderful celebration of Easter I decided to explore the traditions from all over the world of dyeing Easter Eggs. Raising my sweet little chicks I had forgotten why do we dye eggs at Easter time? Since I am now going to have four chickens down the road what am I going to do with all the eggs? I like to make scones but seeing Susan's eggs was an interesting idea.Oh to be so talented! Dyeing Easter eggs is a custom from ancient times from representing new birth,fertility, spring and Christ resurrection.The internet had all sorts of reasons. It is such a fun activity whether your using onion skins,food dye or buying a Easter egg dyeing kit with everything in it .I am sure my daughter will be dyeing eggs this weekend with my grandson. Last Thursday Little Jack and I started our Nana vacation.Thursday til Sunday I was one babysitting Nana. In that time I sold my antique piano too! The little guys parents were out of state so Grandpa and I were babysitting little Jack.My daughter was at Brave girls camp in Idaho and her hubby was in Texas golfing with an old friend. Since Grandpa was at work every day little Jack and I were on our own with a quest to get some Easter chicks. It was so sweet watching little Jacks reactions to chicks as we picked them out. I always tell my husband were making memories! 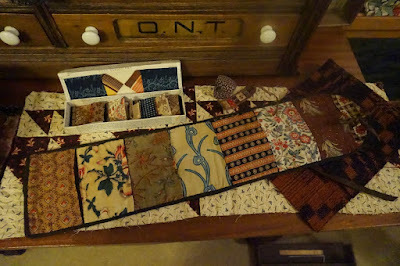 I also have been incredibly slow working on my quilt blocks for the Cheri Payne friendship group. I have to brush up on my quilting! So tonight I have got to get busy and do at least two blocks. Little Jack and I went and visited my cousin at Santee lakes and had a fun time feeding the ducks. Enjoy a Nana vacation. Oh yeah I killed a snake on Sunday! Thank goodness little Jack was already back home. I don't know what kind the snake was. I didn't ask its name.I still feel yucky thinking about it. I felt nauseous especially when it hissed at me! Now I know why people like pigs so much. Every morning I wake up with a very talkative peacock in Crest. I feel like I am at the World Famous San Diego Zoo with strange bird noises. I must admit I do enjoy listening to the sounds echoing thru Crest it just feels so peaceful. There are several colorful peacocks a couple houses down sitting on a neighbors porch which to me would be a little messy.It's interesting to watch those birds as hubby and I go on a walk down our dirt road on weekends.They do have the longest tails that drape over the porch . I will stick with wanting chickens.I also have been observing hawks in the park flying around.There are strange looking lizards with green stripes and of course rabbits. Soon I will have my chicks. Early morning when its warm I will sit in my green garden chair under my umbrella. Morris sitting on the porch and Maulie at my feet. I sip on my one cup of coffee in the early spring morning in Crest. This is the best time of year. I usually have my iPad on quickly checking my email and then putting it away with a sigh time to work in my garden. I went to Dee's a couple weeks ago and I also enjoyed taking picture of what everyone is doing at rug hooking at the Country Loft so enjoy my travels. 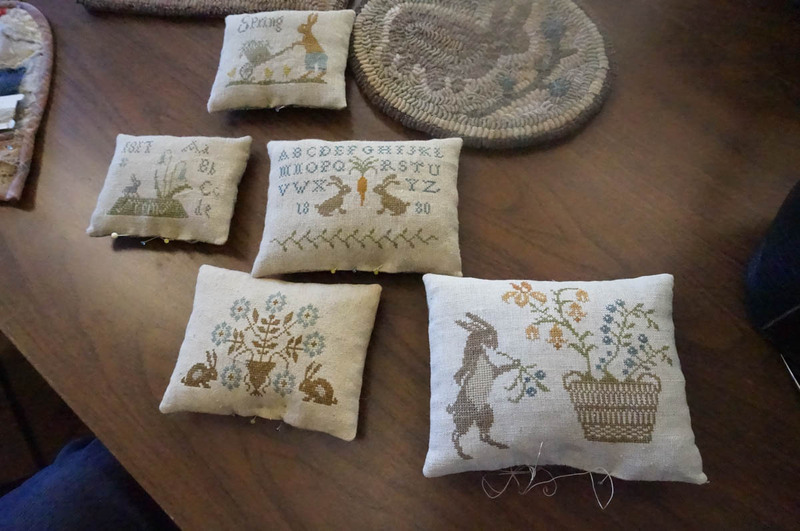 antique fabric from Sarah how kind! As usual I will get caught up with my blogger friends! !